Summary: Those looking for materials related to content area and cross-disciplinary reading may find this annotated bibliography useful. It is organized around three general categories of research and practice: 1) generalized reading strategies; 2) adapting/applying generalized reading strategies to specific content areas (math, science, history); and 3) content area-specific approaches that focus on genres, discourses, and identities implicit in the ways of knowing in subject areas and disciplines. In 1927 William Gray, then President of the International Reading Association, called for “every teacher to be a teacher of reading” based on the idea that reading was a single activity that all teachers should help students to master. In the 1980s, Gray’s call was reinforced and echoed by the “psycholinguistic” work and influence of Frank Smith and Yetta and Kenneth Goodman. Their claim was clear—reading is one and only one thing: independent of context or subject matter, cognitive reading processes are consistent within themselves and across all readers. This interest in cognitive processes led to important research on what “good readers do” and the strategies they employ to read. Ultimately this led to increased emphasis on teachers, all teachers, helping students to acquire these cognitive processes. 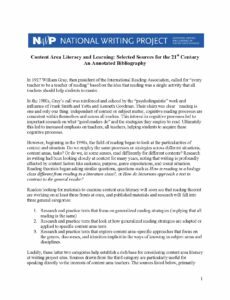 Beginning in the 1990s the field of reading began to look at the particularities of context and situation. Do we employ the same processes or strategies across different situations, content areas, tasks? Or do we, in some senses, read differently for different contents? Research in writing had been looking closely at context for many years, noting that writing is profoundly affected by context factors like audience, purpose, genre expectations, and social situation. Reading theorists began asking similar questions, questions such as How is reading in a biology class different from reading in a literature class?, or How do historians approach a text in contrast to the general reader? Research and practice texts that explore content area-specific approaches that focus on the genres, discourses, and identities implicit in the ways of knowing in subject areas and disciplines. Luckily, these latter two categories help establish a rich base for considering content area literacy at writing project sites. Sources drawn from the third category are particularly useful for speaking directly to the interests of content area teachers. The sources listed below, primarily drawn from these latter categories, were recommended by NWP leaders as having been useful in their professional development and classroom work.